“How can I change” is one of the more common questions when people think through the challenges and responsibilities of transformation. While the answers given vary, sometimes they can be off the mark. For example, here are three not so good attempts to change: (1) Let go and let God. (2) Look out for number one. (3) Let your conscience be your guide. The more technical term for the change process is called progressive sanctification. In the Bible, there are five means of grace that the Lord provides for us so we can grow in holiness. They are God, Bible, Self, Situations, and Friends. The most apparent and number one contender in the change process is God Himself. God changes us. I do not think any believer would argue this point. Though there are other means of grace that can be implemented at different times and in different ways, there is one steady and consistent change agent; God is always part of the change process if sustaining change is going to happen. The testimony of Scripture is clear: God grants change, or what we theologically call repentance. See Acts 11:18; Ephesians 2:4-5; 2 Timothy 2:25-26; Psalm 80:3. If a person wants to change, the first place he must look is to God. All authentic and sustaining change begins with God. Do you want to change? Make your requests known to God. Ask Him to transform you into the image of His Son. The Lord can do this. To some, the request to pray to God about personal change is overly simplistic and, according to them, it’s a worn out attempt to no avail. I understand. There have been many times I have prayed to God to change me, but the best I could tell, I was not improving. As I look back on those times when change seemed slow or to no avail, though I thought my motives and my perspectives were in line with God’s design for me, I see now that I was off-center either in my motivations or my attitudes. In time, a change did come, but not exactly how I thought it would happen, or in the timeframe that I had hoped it would come. Even though God can change you, it is not entirely accurate to think He will do it alone. In the divine wisdom of God, He selected other means or instrumentations of His grace that are necessary for a person to change. Our walk with God is a faith walk, and the way we learn how to walk by faith is through hearing and responding to the Word of God. We inform our faith by God’s Word, and as we walk by faith, we experience change. Here are five simple things I believe will help you to become a master of the Word. As you grow in these simple practices, you will have incredible insight and wisdom regarding how to change. Pray – Before you start reading your Bible, take time to pray. Ask God to open your eyes to what you are learning. Resist reading by rote. Read because you want to, not because you have to do it. Read – Read expectantly. Expect God to reveal things to you about yourself. Look for those things like a man mining for gold. Pay attention. Write – Take time to write down what God has shown you. When your thoughts go from (1) a page of the Bible, (2) to your brain, (3) down your hand, and (4) onto a piece of paper, you are probably going to own it. It will be yours to keep. Teach – At some point during that day tell someone what God taught you. The teacher will learn more than the student, and if you can explain what He showed you, you will start to become mastered by it. As you make this simple way of studying God’s Word part of your regular practice, you can also add memorization to your daily habits. If the Word of God is what it says it is, what better thing can you do than put it in your mind? An imperative is a word that demands personal attention to or a required action that is unavoidable if you prefer a desirable outcome. According to God’s plan, sanctification cannot happen without the participation or cooperation of the individual who wants to change. The most useful part of a counseling session is typically outside the counseling session. I think some Christians are tempted to think if they can receive counseling, everything will be okay. This perspective is not correct. Most certainly many good things can happen in a counseling session, and there have been many times when God became involved with someone during a counseling session. However, it is outside the counseling session where opportunity knocks. The reason for this is because the grind of our daily lives is where we are called upon to respond to what God is doing and allowing in our lives. It is in the daily contexts of our lives that our real selves will be authentically exposed. These are our opportunities to practically apply the grace that God offers to the actual situations in our lives. If a person is unwilling to change themselves, they need to know that a counseling session will not work. Counseling alone is not strong enough to push them over the top. Counseling is 60 to 120 minutes of guidance, compared to a week’s worth of personal opportunity (or obstruction) to change. Counseling success is impossible if the counseling context is the exclusive means of grace for change to happen. It is upon the individual to apply and maintain what he learns in counseling after he walks out the door of a counseling office (1 Thessalonians 5:19; Ephesians 4:30). If God’s grace is empowering, which it is. If God can change me, which He is. If the Spirit can enable me to change, which He can. If God’s Word is sufficient, which it is. If you want to change, you must not think that you can just let go and let God. You must step up to the plate and respond to God by engaging the discipline that He offers you. God helps those who help themselves. In the divine wisdom of God, He has put part of the “changing responsibility” on you to make the necessary changes to mature. In Genesis 50:20 Joseph told his brothers that God meant “it” for good. The “it” in this oft-quoted verse is profound. The “it” represents the cruel situations God allowed in Joseph’s life. The loss of his family and friends. Kidnapped and transported to another country. Recipient of lies and slander. Imprisonment, though he was not guilty. I have never counseled an individual who experienced the accumulative cruelty of the situations that the Lord permitted in Joseph’s life. Most definitely the events in Joseph’s life far exceed the circumstances of my life. Though what he went through was harsh and hard, we know the good Lord was with Joseph (Genesis 39:2), and He was allowing the situations in his life because there was a more excellent plan in the works. You know the rest of the story: God used those situations to change Joseph. Joseph did not resist or sinfully resist continually the situations that had happened to him. As best we can tell he had a God-centered expectation regarding the circumstances that God wrote into his narrative. We also understand he embraced his challenging circumstances and was shaped by them into the person God wanted him to become. If you believe this and if you will cooperate with God, your conditions can change you too. In a split-second or the heat of the moment or by a phone call or when criticism comes or an unfavorable event happens, you have a choice. The situation, regardless of what it is, will change you one way or another. You have no choice about this. The real issue is whether or not you will view and respond to what happens to you as an opportunity to glorify God or will you react to the situation in your life in a self-centered way? David slept with another woman. In the heat of the moment and the dark of the night, David committed adultery. Rather than changing his ways, he chose to cover his steps. You know the story. He had Bathsheba’s husband, Uriah, killed so he could marry her. Once married, he covered his sin, and there was no compelling reason for him to own it or try to change because of it. What David did not count on was the relentless love of his heavenly Father. God loves us too much to let us linger forever in our sin. Sadly, David was “lingering.” He was physically and spiritually deteriorating because of his unwillingness to change (Psalm 32:1-4). Because of God’s mercy to David, He sent his friend, Nathan, to help him change. Though the Lord is the one who ultimately changes us, He may allow people to be a means of grace to help us improve. Nathan was the instrumentation of grace that God chose to use to help David change. People helping people to change is not a foreign concept in the Bible. See Romans 10:13-15; Matthew 18:15-17; Genesis 2:18. God values community: The Father, Son, and Spirit are the original community. He expects His community of faith to partner with Him when it comes to helping people change. How do you change? Are you a Lone Ranger, “pull yourself up by your bootstraps” kind of Christian? Or, are you a Christian who values all the means the Father provides for you to change? To help you think through this, I have put together some questions for you to apply to your life. God – Take these questions to your “closet” and talk to God about them. Bible – Read and reflect upon all of the Scriptures I have inserted in this piece. Self – Write out your answers. Be specific. Be practical. 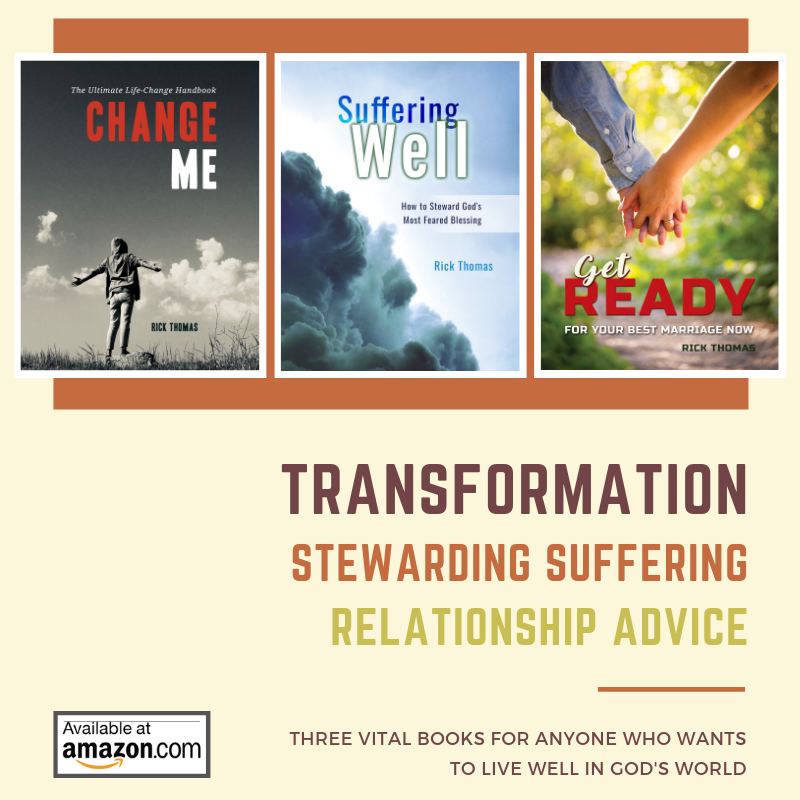 Situations – Ask God to let this situation (call to action) change you. Others – Invite a friend into this process of change by sharing what you discussed with the Lord. 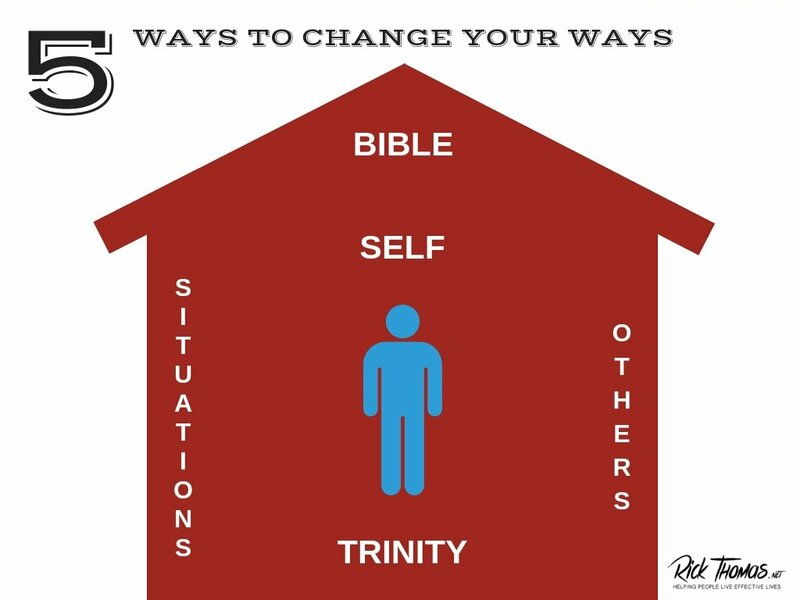 What specific way(s) do you need to change? Do you believe God can change you? Why did you answer that way? Briefly describe a situation in your life that was challenging, but God used it to change you for His glory. Briefly describe a situation in your life that was challenging, and you responded wrongly to what the Lord was writing into your narrative. How are you generally characterized when unfavorable situations happen to you: (a) You appropriate the grace of God typically and work through the situation biblically? (b) You generally react sinfully and make things worse? Describe how God is using a current situation to change you? (a) What are you learning? (b) How are you changing? (c) How is God’s name made great to those around you because of your responses? Do you cherish the community of faith as a means of grace to help you change? Explain your answer. Do your closest friends know all that is appropriate for them to know about you? Why did you answer that way? If you are married, do you purposely create contexts of grace where your spouse can bring correction to you? If you have children, have you provided contexts of grace where they can bring correction to you? How aggressive are you in pursuing correction from others? Explain your answer. Would you say your friends characterize you as a person who pursues them to help you change? Are you holding them accountable to help you improve? Name one thing you would not want your friends to know about you? (Read Psalm 32:1-4) How do you need to change regarding this?